Seems like an eternity since returning to Ecuador! It�s amazing how God took three of us men from the United States and three Ecuadorians to a place where God chose to work. I was excited once again to team up with Don Dumas, a pharmacist, who has the gift of evangelism and with Bro. Wil Pounds. God has placed Bro. Wil in Ecuador and is using him in a mighty way to equip others through seminary extension courses, discipleship conferences, pastor conferences and evangelism workshops. I have looked forward to serving with Alejandro Guacho Coro, Jefferson Copa and Damaso Francisco. 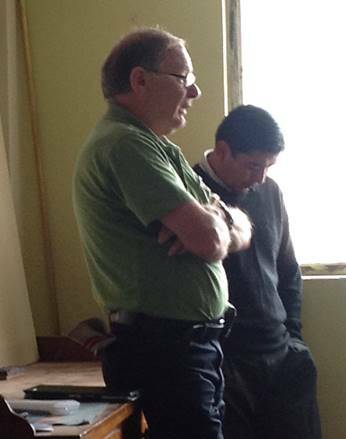 Damaso is a Bolivian and a professor at Peniel Seminary. Eighteen year old Jefferson, my translator and a university student, is Alberto Copa's son. 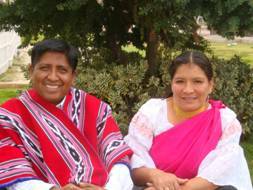 Alberto is a pastor and director of Peniel Seminary of which he started in 2010 with 13 students. Now there are 200 students at the seminary. This mission week entailed helping some of the communities by extracting teeth. This outreach is not a replacement for evangelism, but it�s to complement the evangelism efforts of two local startup churches. It was exciting to see how God brings everything together for His glory with the unknowns that lie ahead. But as always, when God calls, God equips and God provides! Pictured on left are Damaso Francisco, Alejandro Guacho and Jefferson Copa. We arrived late Friday night to be met at the Quito airport by Bro. Wil and Alejandro. After spending Friday night in Quito, we spent Saturday morning rounding up dental supplies and traveling to Riobamba and stopping for lunch in Ambato. Saturday evening we searched for tables and what could suffice as a dental chair. 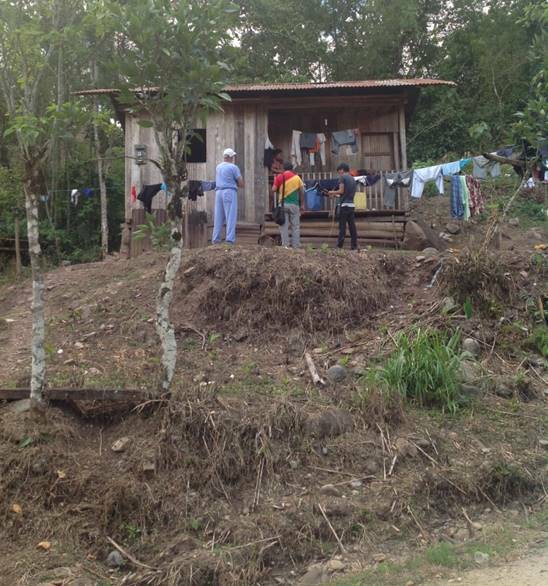 Without finding the much needed chair, we headed to San Juan de Guabo Sunday morning as we trusted God to provide. 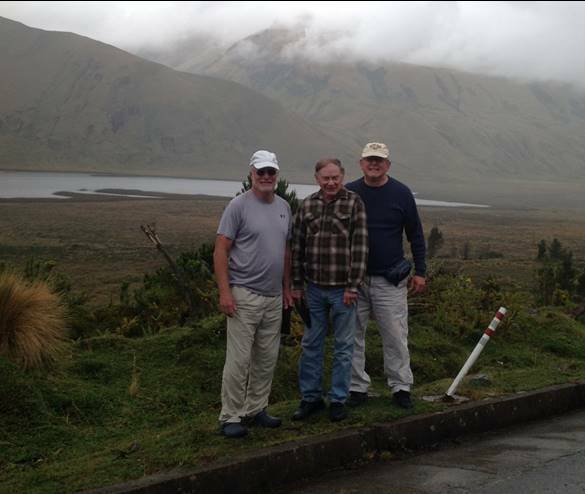 Pictured above left to right are John Howell, Wil Pounds and Don Dumas at high Andean lake around 12,000 feet. Saturday night we arrived in Riobamba, located right in the middle of Ecuador. Sunday morning we left early for Guabo, further east, to extract teeth in a village where Alberto Copa has begun a ministry. 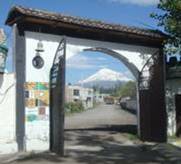 The village is at the base of the volcanic snowcap mountain, Chimborazo. There were warnings that Chimborazo may erupt at any time. If that happened, all of the area around Riobamba would have to evacuate. 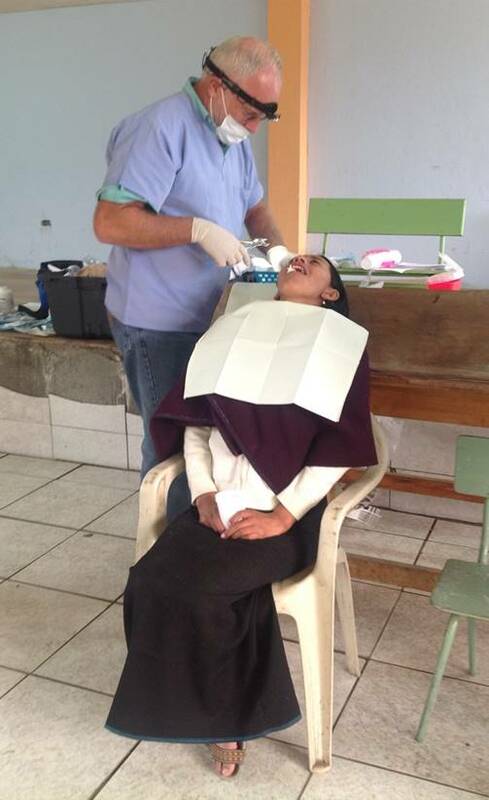 Pictured above is Dr. Howell with a Quichua dental patient at San Juan de Guabo. Sunday was a good day! 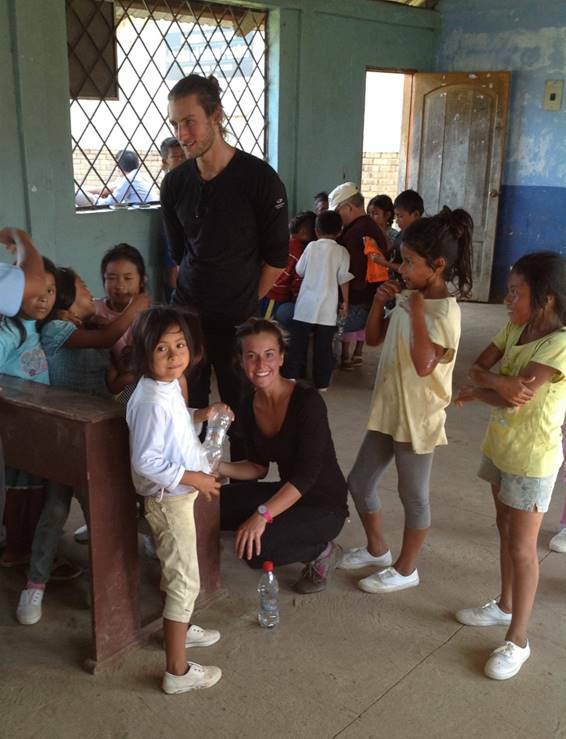 We arrived at San Juan de Guabo around 10:00 a.m. and set up a dental clinic. Using a table placed behind a plastic chair, we found a board which Don leaned up at an angle against a box of Gideon bibles for a head rest. God had provided a dental chair! We were able to see 45 patients and extract 42 teeth. While the dental clinic was busy, Don Dumas was sharing the gospel with the locals. Praise God for 22 salvations! I was impressed by how these dear people were anxious to help with the needs for the day. What a delicious lunch of beef, corn, potatoes and salad the church provided. Sunday night we had church services at Genesis Bilingual Evangelical Church where Don and I shared our testimonies. Praise God for a great day! Monday morning we checked out of Hotel Laguna for a 4 � hour drive to Sucua. It's not uncommon for roads to be washed out in places during the rainy season. Parts of the road were washed out and covered with mudslides. Thankfully the road was cleared enough where it was passable. By 2 pm we were ready to stretch our legs. We found a clearing where we could look out and enjoy God's beautiful creation. Traversing the hillside was a narrow path that led down to some houses. Approaching us was a young man with a machete. As Bro. Wil introduced us and conversed with him, he told us of six families that lived in the bend of the river. Bro. Wil asked the young man about his relationship with Jesus Christ. After sharing the Roman Road, he prayed to receive Christ. What a beautiful witness of a divine appointment on the road to Sucua! Pray for Marcelo Laylla. 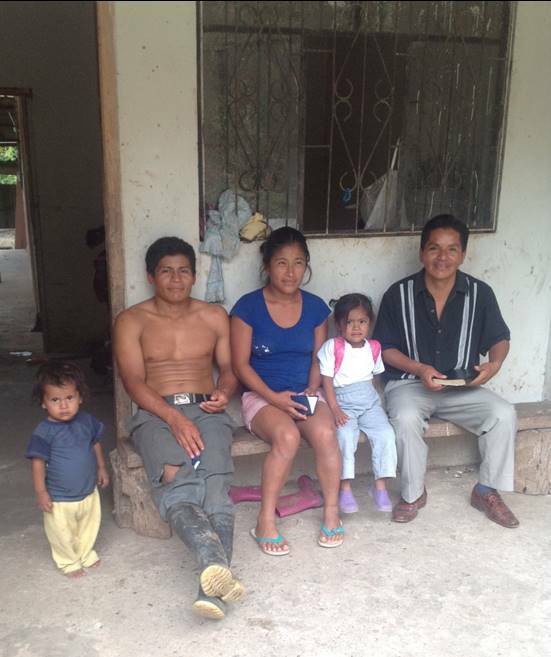 Pray Marcelo reads his New Testament daily and shares his testimony with the other families. 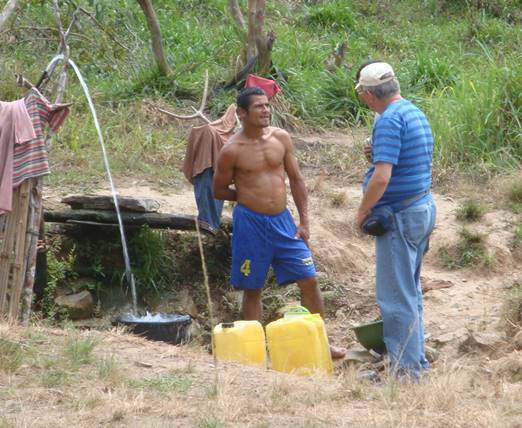 Above Wil Pounds is seen leading Shuar farmer to Christ. By 3:15 we arrived in Sucua, checked into the hotel and found a restaurant. For dessert we walked to an ice cream shop where we met a couple, Florine and Mayra, from France. As tourists they were traveling all over South America by motorcycle. 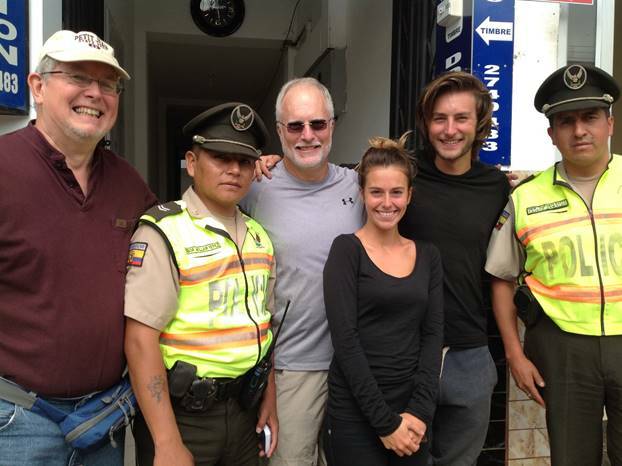 Don Dumas, John Howell, Myra, Florine and two friendly Ecuadorian policemen. Tuesday morning after having a tasty breakfast, we met up with Florine and Mayra as they were being questioned by immigration authorities. The police took their pictures and their passports. After questioning them, the police asked to see Don and my passport and likewise took pictures. We didn't let the police leave without Don giving them Gideon New Testaments and sharing the Gospel. They allowed us to take a photo of them with the couple and us. Afterwards we began visiting with Flo and Mayra. They expressed that they were atheists, and their interest in finding a route into the jungle. So we invited them to come along with us for the day to Chivias. Picturedabove is a Shuar couple in typical Shuar costume. What a day in Chivias! This is jungle territory where the gospel has never been proclaimed and has no Gospel witness. None! The villagers are engraved with the witchdoctor�s witchcraft and voodoo vices. We set up the dental clinic and saw just a few patients. The children were amazed at the dental clinic and wanted to know what each instrument and item was used for. I recorded 10 dental patients with only 5 extractions, but praise God for 11 people who committed their lives to Christ. Our new friends from France fit right in with the group and were very helpful. Their hearts were touched and as we left that afternoon, they had tears in their eyes. No doubt, God brought us all together for a purpose. And that too goes for the witchdoctor who made his presence known and said his chants and did his dance. After our visit we left with a heavy heart. My prayer is that they received a glimpse of Jesus! Pictured are Myra and Florine with Shuar children in the Chivias community. On the way back to the hotel, Don invited this French couple to join us for a Chinese dinner. This gave us more time to visit. Bro. Wil asked them, "What has been your most memorable experience on your journey so far.� Their response was, "Today!� I pray the Holy Spirit will use this day to begin to open their hearts to the Gospel. Wednesday morning we went to a tourist demonstration of the Shuar. (The Shuar were once known as the headhunters of the jungle.) 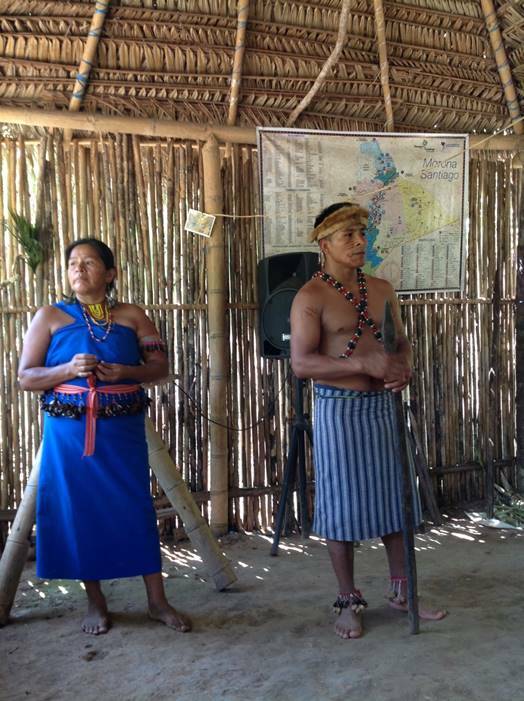 The demo consisted of Shuar dancing and a hike. The guide said all of the people were in town for a celebration. He invited us to return the next afternoon so we could set up a dental clinic. 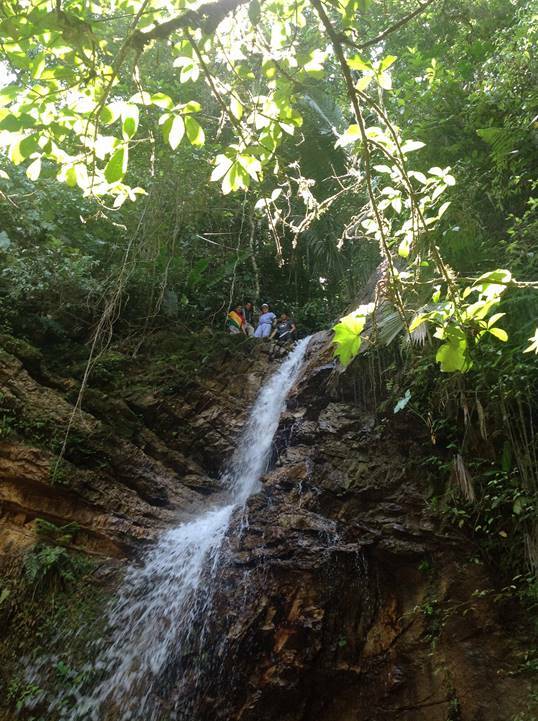 Pictured above is the Evangelism team at the Kintia Panki water falls. We drove on up a road towards another village. (This was an unknown area to Alejandro and Bro. Wil.) The area was beautiful with houses spread out along the river. 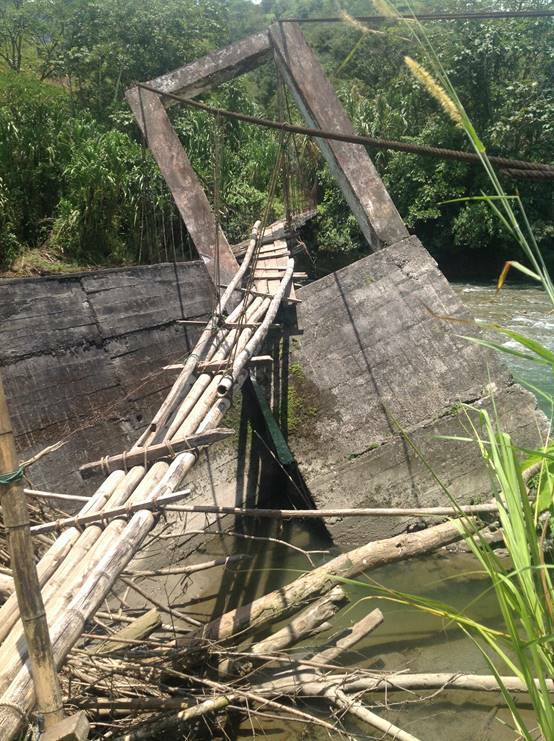 At one time the road crossed the river but the bridge had collapsed and it is now used as a walk bridge. 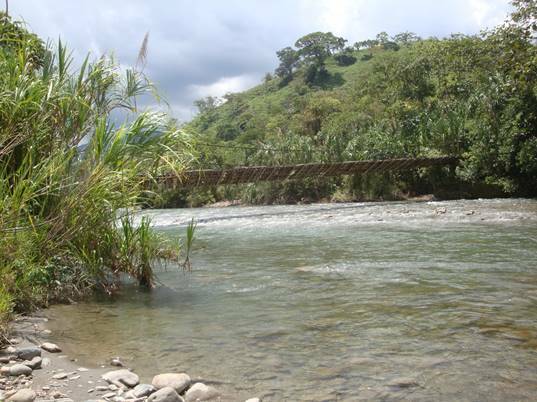 Jefferson, Alejandro, Damaso and I �questionably� crept on the rickety bridge. On the other side were two more houses. 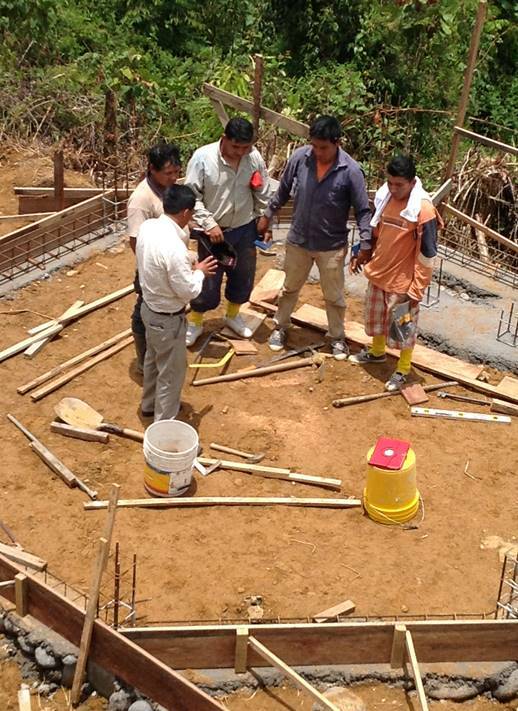 At the first house, Damaso shared the gospel with a young lady with two little children. She listened but was not ready to receive Christ. At the next house was a young man by the name of Evan Chuin and his wife and two young children. Alejandro visited with him and explained the gospel. His wife went back into the house during the presentation. (The house smelled like she was cooking and probably went to check on her food.) Evan continued to listen with understanding. He prayed to receive Christ. We didn't have any New Testaments so Jefferson went back across the �ify� bridge to get more. As we continued on up the road, we approached a young man named Brayon Unup. We greeted him, Damaso shared the scriptures and Brayon prayed to receive Christ. Praise God for divine appointments! Supposedly, there were no more houses up the road. So we turned around to get back across the walk bridge before the rain. However, there at the house where the young lady and two little children were outside on the porch. Alejandro went up to give the mother a New Testament. Out came two other people to listen. There were no decisions, but Alejandro prayed with the family. Pictured above: Dr. Howell, Damaso and Jefferson witnessing to Shuar family. We tramped across the bridge again! While we were standing by our truck, we could see an older man and woman trudging up a trail from down river. With a little pressure, Alejandro and Damaso introduced all of us. Although the couple was very skeptical, they gave the men permission to speak about the Bible. Bro. Wil and I backed away so as not to gang up on them and to pray. Together, this older people prayed to receive Christ. Another divine appointment! 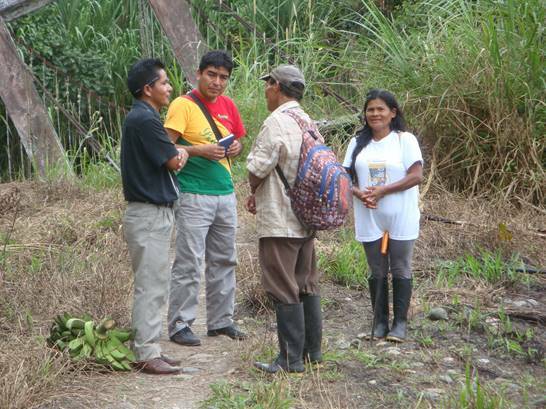 Above is Alejandro and Damaso witnessing to Shuar farmer and his wife. Bro. Wil, Alejandro, Damaso and I waited at the truck while Don and Jefferson went to make a visit. They came back with a report that a lady listened attentively, and she too accepted the truth of God�s word. As we were standing around the truck and celebrating these salvations, a group of high school students came by. 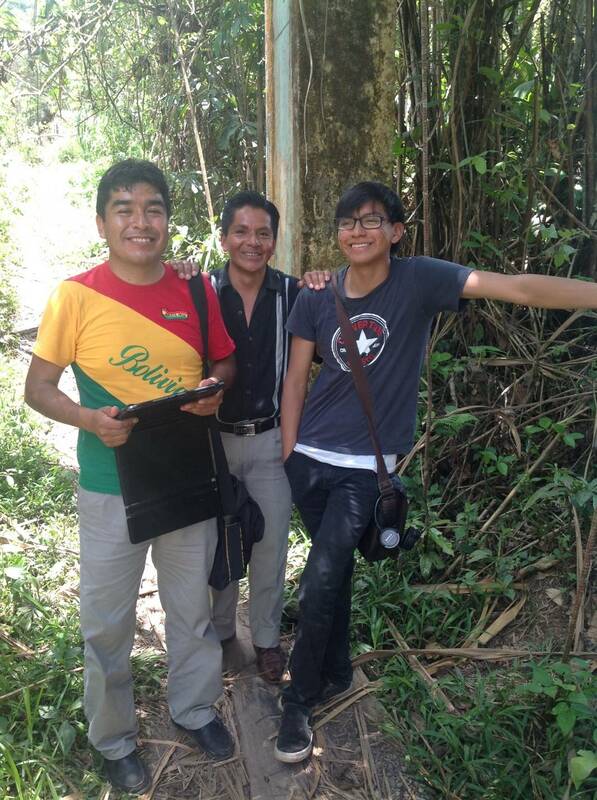 We handed them New Testaments, and Alejandro shared the Roman Road. There were three girls and three boys ranging from 13 - 16, and all prayed to receive Christ! Hallelujah! Above: Teens registering their decision to follow Christ in their New Testaments. As we drove out, we decided to turn down a road to see where it led. The road went down to the river to what looked like a park or retreat center. There was a group of seven young people out on an island in the middle of the river. They looked to be teenagers and were building a fire. We were trying to decide whether to attempt to wade the swift river or not. After several minutes contemplating the challenge, Don, Jefferson and I rolled up our pants� legs and hit the water. Was it ever cold and swift! I held Dan's left hand to help steady him while he held on to a stick with the other. Slowly, we made it to the island and introduced ourselves. These were college and high school students, and three of the youth had spent time in the U.S. and spoke good English. At first there was not a lot of attention from them, but as Don continued to share Christ, they became very intent on what he was saying. You could watch the conviction overcoming them as the Holy Spirit opened their hearts as they received Christ! Their names are: Jair Zeas, Romana velez, Prisci!a Vasquez, Juan Pablo Gomezjurado, Angie Marin, Hjalmar Gomezjurado, and Monica Chica. Pictured above: Don Dumas, John Howell and Jefferson returning from the island in the river after witnessing to a group of students. We drove back to Sucua, rested up for a time and ate. Across the street was a park, a perfect place to relax. We stopped at a gift booth in the park and Bro. Wil shared Christ with two men working the booth. There was no response from them but seeds were planted. Bro. Wil said he was going to turn in for the night, and Don and I walked over to a park bench and sat down. A young man who spoke English walked up. His name was Juan and he owned the yogurt shop where we had been getting a bowl of yogurt every night. He was from Sucua but had spent a lot of time in the U.S. Don introduced us and asked the young man what he thought about how he could get to heaven. He gave the typical answers: be good, go to church, be kind to others, etc. I asked Juan, "If what you believe was not true, would you want to know." He responded with excitement, "Of course!" We began by telling him of God's love and let him read John 3:16. Don asked him what that verse meant to him. After each verse Don would ask Juan, "What does that verse mean to you? When the question was asked if you would like to receive the free gift of eternal life, Juan responded, "Of course!" What a great ending to a wonderful day in the downtown park of Sucua! 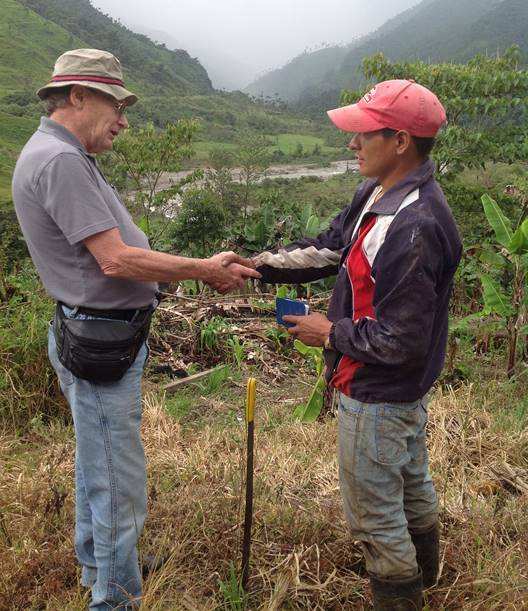 Above: Don Dumas witnessing to a Shuar farmer. Thursday morning we asked for directions to the road on the opposite side of the river from where we were yesterday. We fueled up the truck and headed out to find the road. The first people we met were two young men. One of them was washing containers and the other was feeding hogs bananas. Bro. Wil introduced us all, and Alejandro took the lead in sharing the plan of salvation. Both men gave their hearts to the Lord. What a beautiful beginning to a new day! 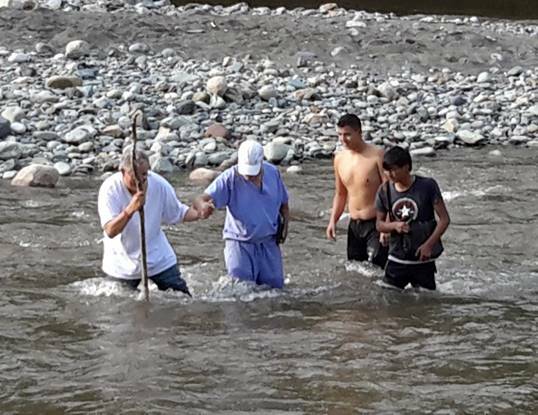 Above: Alejandro leading a Shuar pig farmer to Christ in his field. At the next house there were two men. Jefferson did an excellent presentation of the Gospel to one of them while Damaso presented Christ to the other. They both wanted to think about it. In the afternoon we went back to the Shuar village and set up the dental clinic. We saw 18 patients from the small village. Most of them just wanted their teeth cleaned, but I didn�t have the necessary instruments. It was surprising that their teeth were so healthy. I only extracted three teeth on two patients. When we finished with the patients, Jefferson did a wonderful job teaching the children about Jesus and singing songs. A Shuar family then fed us a meal which consisted of fried plantain and a boiled egg and tea made from the Guayusa plant served in a gourd. We planned to visit another community, but the rain came and we traveled back to Sucua. I pray God will lead us back to this village soon. After packing and saying goodbye to the locals, we headed out to the city of Macas to visit an American missionary. Unfortunately, she was not at home so we continued on to Riobamba. After sipping on cold ice tea, it was necessary to make a rest stop. We pulled off to where an observation tower was under construction. Four men were hard at work laying the foundation. 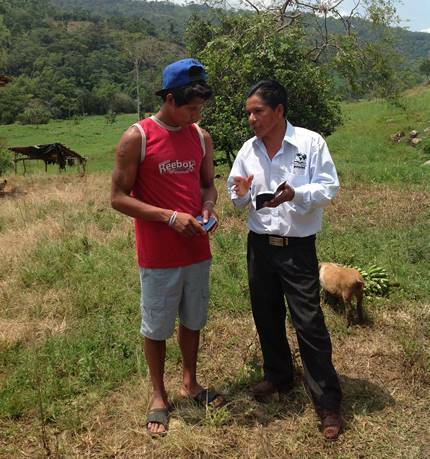 Don gave Alejandro a New Testament and encouraged him go and share with the men if they had time to visit. The workers stopped and listened as the Roman Road was explained. Their hearts were opened to the Word of God, and all four prayed to receive Christ. Another divine appointment along the road from Sucua to Riobamba! Above: Alejandro is seen leading four tower construction workers to Christ. In time for the next rest stop was another observation tower, and we could see a man bent over doing something. Alejandro, Don and I located a trail that led down to the man. There in a corn field was this farmer and his wife and two daughters. 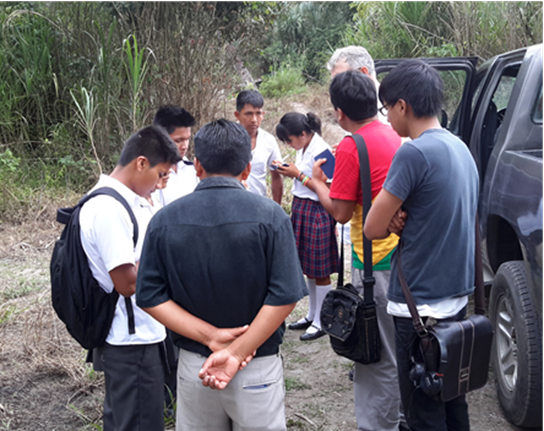 They kept working and took intermittent breaks to listen as Alejandro shared the gospel. Don gave them each a New Testament. They said they were Catholic and not interested. Alejandro thanked them for their time, and we walked back up the trail to the truck and continued on to Riobamba. 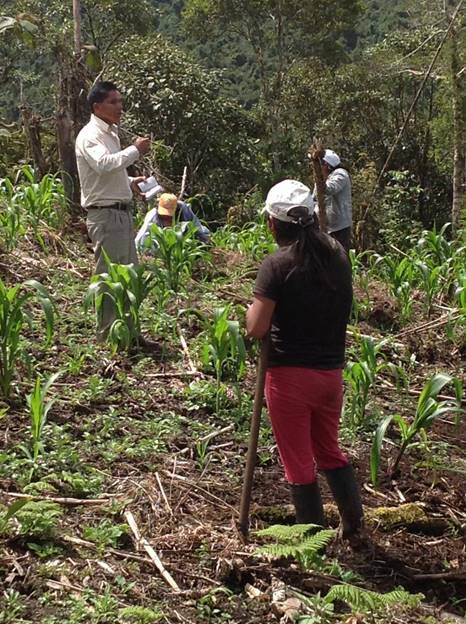 Above: Alejandro in a field witnessing to a farmer and his family. Saturday morning we went to Peniel to speak to the seminary students. We reported on the week and encouraged the students to share the gospel. It was good to see Alberto and Nancy Copa. The seminary meets in their home. Afterwards we drove to Quito to catch our flight back to the states. What a great week of witnessing God at work in the different communities in Ecuador! We witnessed 59 professions of faith, saw 73 dental patients and extracted 50 teeth. Everything was beautifully orchestrated, and GOD DID IT! Damaso pictured with Wil challenging the Saturday students at Peniel Theological Seminary to be faithful witnesses.